On Monday, July 15th I received an email from Petra Honneff. Her mom and dad had come down to her place, from Winnipeg Manitoba, to visit and they wanted to meet me! It is a long drive between us, about 3 1/2-4 hours, but Petra said he would be happy to do it if I didn't mind them invading our house. This was the greatest invasion in the world so I said, please come invade our house, and we set the date for the next day - Tuesday, July 16, 2002. Fate is a strange lady sometimes - the first veteran I get to meet in person is the first veteran who helped me with my website - Peter Honneff. We visited for 4 hours, talking about WWII, Indonesia as well as modern day news - it was simply wonderful - and I was given strict instructions to write them in Manitoba, and from Petra that Larry, Josef and I were to come visit her. I always try to do as I'm told. Petra and I both took photographs and I will put at least one of them up as soon as they're developed. This is one day I'll never forget. 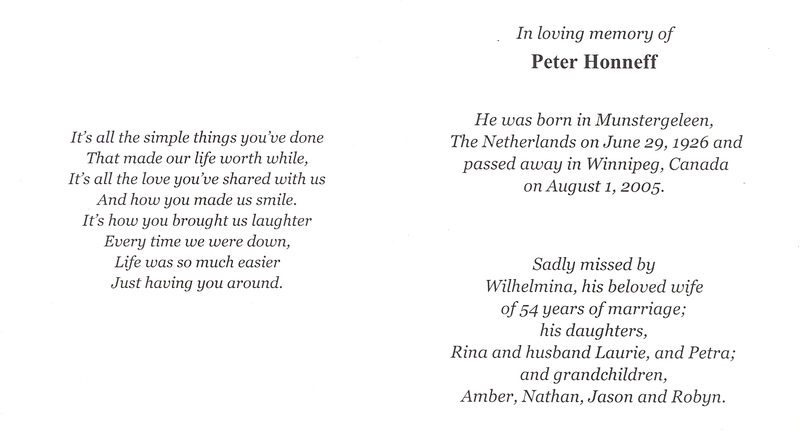 On August 1, 2005 Peter passed away very unexpectedly. Petra was kind enough to let me know and to send me his memorial card, which I've put up next to his photo with his wife's permission. Peter will always live in my heart and on this website. 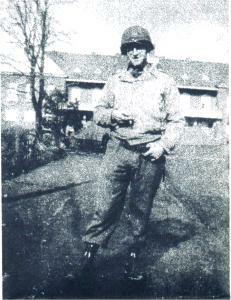 My dear friend Mr. Bill Smits, who has helped me learn so much about my dad sent me these photocopies of two of his pictures from the War, taken in Germany, 1944 working with the US 9th army, 29th division. Thank you Mr. Smits. This is a photograph taken of painting of Ton Van Tellingen (changed to Vantell when he immigrated to Canada)which he had done in Semarang, Indonesia in 1946. 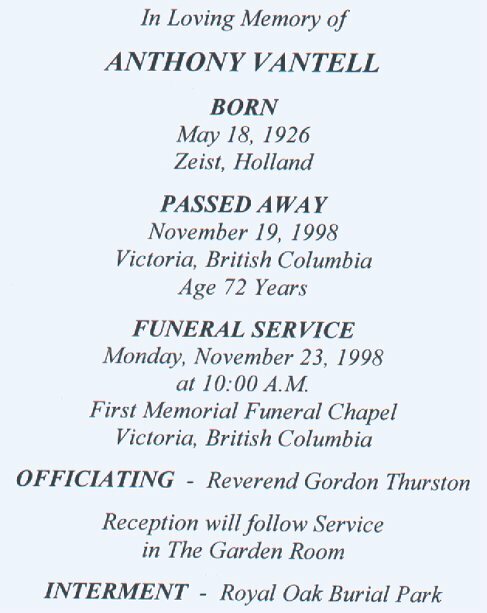 I have just learned that Mr. Vantell has passed away. Rest in peace Mr. Vantell. You made the world a better place and helped two strangers with your kindness and caring. 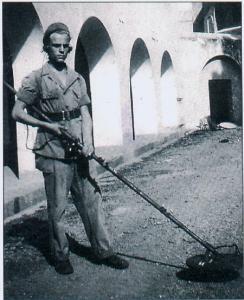 This is Mr. Cor Korremans sweeping for mines and explosives in a concentration camp in Indonesia. 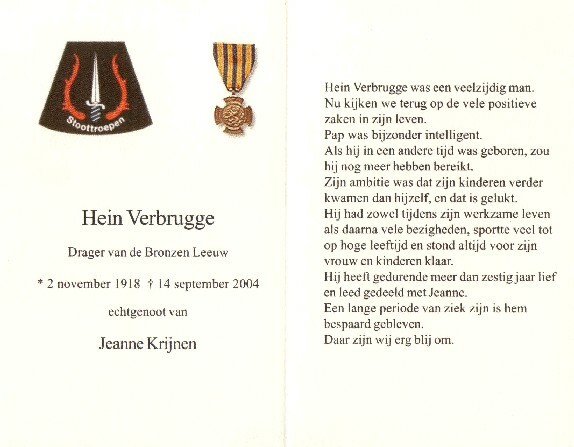 He was a member of the Tijgerbrigade. I found him by searching the internet on Stoottroepen and Indonesia. He was the one who put me in contact with Mr. Schepers and has published an article about my search for information on my daddy. Mr. Korremans has been a major help in my quest. These two men are Mr. Tjeu Schepers, was a medic in both WWII and Indonesia, and went to Hoensbroek to find out the names of the men in a photograph I had, and Mr. Jan Bongers who was also in Indonesia and returned home August 1948. He is the father of John Bongers, Mr. Scheper's son-in-law who has been the wonderful man who has used his internet connect to keep Mr. Schepers and I in touch and John has done a great deal himself to help, translating forms, making calls etc. 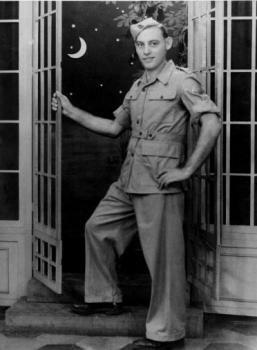 Hein Verbrugge, my dad's commander during his time in Indonesia with the 1st Regiment Stoottroepen passed away September 14, 2004 at the age of 86. This wonderful man gave me 5 of his own photographs to put up on my site and to keep for myself as well as a wonderful letter telling me about daddy that I will cherish forever. 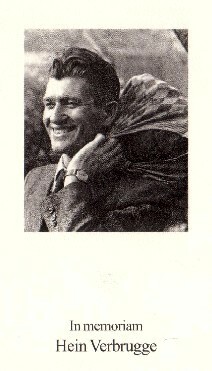 Henk Verbrugge, the oldest son, included an English translation of the prayer letter. 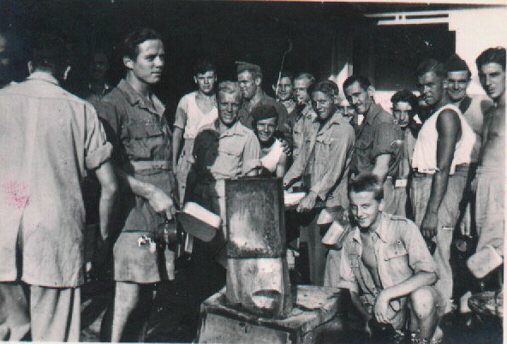 Mr. H. Winkens, man on left with three-quarter profile holding metal box was part of the 1st Regiment Stoottroepen. 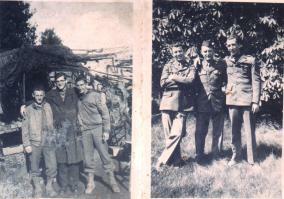 He not only told me about the war but entrusted me with 26 of his photographs to scan and place on my site. 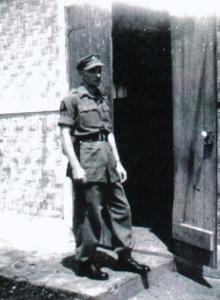 Mr. Ted van den Driesschen, was also part of 1st Regiment Stoottroepen and a member of the Underground. He has been a very special help to me with my website, translating, talking about his experiences and letting me put them online and if he can help someone who writes to me asking to help them learn about their special Dutch veteran he doesn't hesitate to do so, and I've learned about the Brabant Regiment of the Dutch Underground. You can find different stories he has told me throughout the website. Mr. Schenk was the first person I contacted in the Netherlands to find out if he knew my daddy or knew of anyone who might have known daddy. He wrote me back very quickly to tell me he never knew my daddy but knew a veteran who not only knew my daddy during the war but also grew up with him and that he had given my letter to this veteran who promised to write me back. 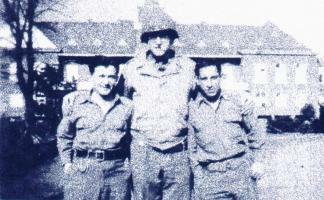 That veteran was Mr. Bill Smits who I not only keep in constant contact with through letters but also telephone calls. Without Mr. Schenk I never would have met or formed a loving bond with Mr. Smits. Mr. Schenk will always have my deepest gratitude and will always be remembered. Left to right: NORBERT OSSINSKI, Mr. Smits, BILL KERSLEY; PETER DURA, RAYMOND GIRTS, BILLY KERSLEY. Members of the 2ND US ARMOURED DIVISION known as "HELL ON WHEELS" ALTLAS REAR , mechanics division RED HORSE. 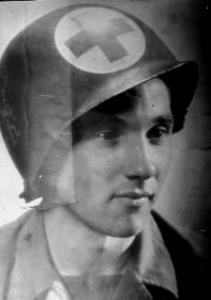 Met in September 1944 outside Brunssum and later in a rest stop in Sittard. A dear friend of mine, Mr. Bill Smits, would like to find out about the men in this picture and reestablish contact with them if possible. He has asked my help, and it is the least I can do after all he has done for me, telling me about the war, my daddy as a soldier and a child. If you know these men or know of them please let them know that Mr. Bill Smits of Holland is looking for them and contact me, I will be able to give them Mr. Smits address or if they prefer I will give Mr. Smits theirs. Thank you!